It seems as if we are to hear what the plan is going to be for the US Banking System as early as this week. My we are in a pickle. Maybe a pickle jar. 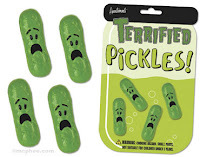 Maybe a pickle pool. Maybe an ocean of pickels. What is the likely outcome????? I offer to you not my opinion, but those of a smarter bunch then I. Up second is Baseline Scenerio – a blog I have recommended to you before – that will link you to two recent opeds from the FT and the WP – both worth the read. Will we end of with a Nationalized Banking System? You tell me………. Next Post Dear Diary plus…"Did You Know?……." Great post. And… question for you on the topic of finance & money. Will and should the Obama Administration bring back real social security and pension versus just 401(K)'s? Doesn't seem fair that someone who works in a grocery store her whole life and who can't afford to save should have to extend retirement or go without when so many of us who work the same hours can afford to save for retirement? Your thoughts?